Alana and Margot left their lives like spirits. Quickly and gracefully, they fled through the air to escape their fate with Hannibal. And Will has passed through the veil and left his life behind. He couldn’t save himself, so he left the world he knew to join the underworld with Hannibal. Instead of killing them all to save himself, he damned them both to save his family. Francis tried to save his family, in a way. He shared with Reba that he was the Red Dragon, and then he left her alive, allowing her to believe that he had killed himself. Fake deaths are not my favorite, but this one was both disgusting and awesome, and I thought it was great. Making Reba believe Francis killed himself was his way of getting her out safely and getting the police off his back. It was also terribly cruel. He left her alive, technically, but the memory of crawling through brains to escape a burning building will haunt her forever. Francis’ fake death was the first OMG moment in an episode full of them. (Let it never be said Hannibal didn’t go out with a bang.) The next one was Francis pulling up in a police car next to Hannibal and Will, and shooting the driver with expert proficiency. It seems that Francis took a few pages out of Hannibal’s book on how to be a supernatural force of death. I love that Hannibal jumped out of the van like he absolutely expected this all to happen, and isn’t everything going just swimmingly, and c’mon Will don’t you want to come with me so we can get on with our afternoons? But nothing beats the moment of the fight between Hannibal, Will, and Francis. Every shot was delectable and the music was so perfect. Will and Hannibal finally became the murder team Hannibal had wanted since he planned his escape with Will and Abigail in season two. This was Will’s becoming, and he gave in to Hannibal’s darkness. It started with Francis shooting Hannibal. The red wine Hannibal was holding spilled, like their blood would later. Hannibal falls to the ground, and the camera shoots him from above, making Hannibal look truly small and vulnerable for maybe the first time. But Francis turns to Will first, stabbing him in the face. Will is the only one who ends up covered in bright red blood, showing he is a mortal in combat against two supernatural beings. When blood spills on Francis, it looks black in the moonlight, like a dragon’s blood, not a human’s. The murder team of Hannibal and Will hack at Francis until he is gone, and the wings of the dragon no longer appear. (How cool were those dragon wings?!) “This is all I ever wanted for you Will,” Hannibal says. “For both of us.” Will lets Hannibal think he got what he wanted, and they embrace, finally, before Will jumps off the cliff, taking Hannibal with him. There is a lot to unpack in that ending, and probably a hundred ways to interpret it. Not to mention the kicker, with Bedelia -- legless -- at an extravagant table set for three. In my own interpretation, Will chose to go off the cliff with Hannibal in order to try to destroy them both. It was the only way he knew to finally rid the world of the darkness that emanates from Hannibal and destroys everything it touches. But at the same time, Will did give into the darkness, at least in part. He knew Hannibal would escape as soon as he made a plan to get him out of his cell and into police custody. He knew that those cops were likely to die if they were transporting Hannibal. And he knew he’d want to kill Francis. He chose to run away with Hannibal so they could kill together. I’m also choosing to believe that Will and Hannibal survive the cliff fall. If Dr. Chilton can survive being shot in the face, having his lips ripped off, and being burned alive, why couldn’t Will and Hannibal survive a fall into the ocean? And why couldn’t they decide to go on the run together, as Bedelia did with Hannibal to Europe? She has always been fascinated by Hannibal, and did she look a little excited -- as well as scared -- when she was sitting at that table, about to dine on her own leg? On the other hand, it could be Hannibal by himself, or a copy cat cannibal, or Bedelia could have also gone over the edge, finally giving in to the darkness, and prepared her own leg while setting the table for the ghosts of Will and Hannibal, who may never arrive. I could go on and on, but now it’s your turn. What was your favorite part of this finale? Do you think Hannibal and Will survived? I’ll miss writing about Hannibal each week here, but you can always find me on Twitter or subscribe to my newsletter where I talk about what I’m reading and watching. Thanks for reading along! I love you all more than Will loves his dogs. Coolest shots: Will in Bedelia’s office, Will’s face so large and close to the camera it looks like he could open his mouth to eat her up; the blood oozing out of Francis, and the film strips spreading out from him as they burn, just as the strings of blood spread out from Will when he investigated Francis’ crimes; the entire fight scene from start to finish; a headless corpse in front of a screaming Reba; the beautiful confusion of Will and Hannibal’s van crashing; the beauty of Margot and Alana leaving their home, Alana looking back at what she’s leaving behind. It was good to see Team Sassy Science again! Jack has so much blood on his hands. It was fitting to me that the last time we saw him, he was dealing with the bodies left in Hannibal’s wake. It was like he was walking through the underworld he helped create. Margot and Alana looked stunning, as always. Glad to get a glimpse of their son. If I were a cop assigned to Hannibal, I would quit my job and leave the country, probably. Do you think those cops knew that they were part of a scheme to catch Francis? Where was Molly in this plan? Do you think Will shared it with her? I’m in complete denial that this could really be the end of the series. Thank you, thank you, thank you Rae for your reviews from Hannibal. I have read all of them, and i´ve think a lot of times to write you, but my english is so bad that i was embarrassed. 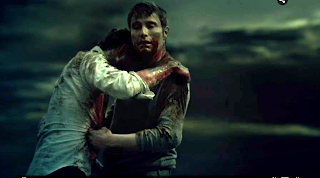 Like you, i´m in a denial that this is the end of Hannibal, but i have to say that i love how it ends. I really love the very end! So .... thank you for doing that for this amazing show, that for me it has been one the best shows ever. THANKS. I send best regards from spain... and i hope i read more of your reviews in the future. No, thank YOU. Every one of your comments has been so wonderful, I appreciate you so much. Thanks for reading along! I love, love the end too, and I'm so sad Hannibal is over. I will definitely be around the site--I'll be reviewing Empire when it starts again this month!